← Making HRV More Practical For Athletes: Measurement Frequency? It’s been a quite a while since I can honestly say that I completed a successful training cycle with little interruption. After Christmas break I had a 9 week cycle tentatively planned out. As you’ll see, the plan changes due to unforeseen events, but training manipulations were made and the cycle was successful; resulting in some gym PR’s which haven’t been made in a long time! Weeks 1-4 were of moderate intensity (75-85%) and higher volume. An example of a typical workout from this phase would be 5×5, 6×4, etc. However on deadlift day’s I’d rarely perform sets with more than 3 reps. Weights were selected based on RPE and guided by previous session’s working sets. If you look at my trend closely however, you’ll see that week 4 was a lousy week and my workouts were adjusted accordingly (more below). Weeks 5-7 were of higher intensity (85-90%) and moderate volume such as 3×4, 4×3, etc. Week 9 was test week where I worked up to as close to a 1RM as I could get safely (I train alone). Essentially I was blocking my training up into an “accumulation” period, a “transmutation” period and a “realization” period. I use those terms loosely however. Below is a screen shot of my HRV/sRPE trend from the last 3 months. The training cycle began on Jan. 7. This is following a period of detraining over the holidays that you can clearly see early in the trend. Week 1 – Post-Christmas holidays and I’m detrained. I began lifting 3 day’s/week to let my body get back into the swing of training with plans of moving to 4/days week in week 3. Though the workouts aren’t very intense, I experience large drops in HRV in response to workouts. My body is clearly adapting to the re-initiation of training. Week 2 – My body appears to have adapted well as I experience very few low HRV days. 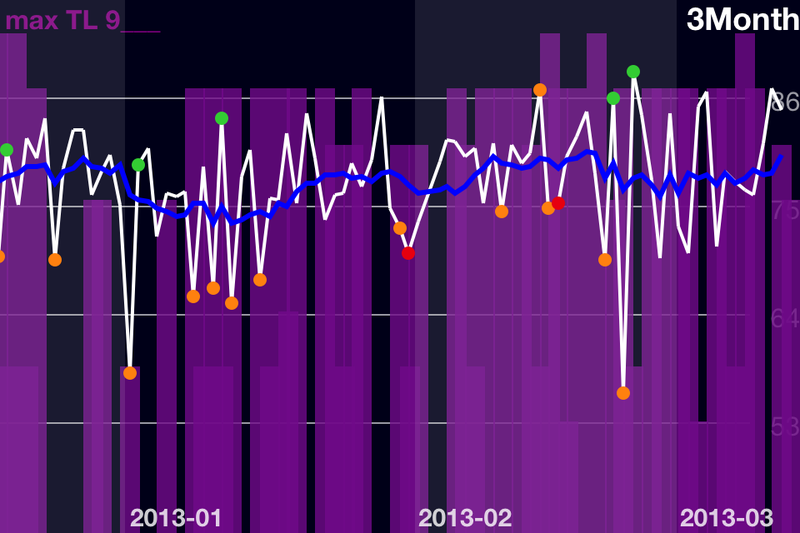 HRV peaks on the weekend after some rest. Week 3 –Switch to 4/day week lifting schedule. I was surprised that I didn’t see some lower drops this week. HRV peaks again on the weekend after rest. Week 4 – I miss a workout due to snow day. My HRV is low practically all week and the weights were feeling heavy. I decided not to push it and essentially deloaded with sRPE’s of 7. Below is a screen shot of my data as it appears when I export it to excel from ithlete from weeks 2-4. *Regarding the comments section, I document some random stuff sometimes. This is simply because I plan to review that data at a later date to see if I notice any trends. For example I note when I have ZMA before bed to see how it effects sleep score and next morning HRV. I’ll try and make note of any changes in nutrition, etc. Since I keep a training log I only document brief details about workouts on ithlete. Keep in mind that the comments , Sleep score and sRPE are all referring to the PREVIOUS day/night. So for example, when you see an sRPE of 8, it was from the workout on the day before. Lastly, I work days/evenings working with athletes so I typically stay up a bit late and therefore wake up later in the morning. Weeks 5-7 run smooth. Training goes well and HRV responds well as my trend actually increases a bit. HRV reaches its lowest point on a Saturday morning at the end of week 7. This was after a long day of work, a workout and a football skills practice I helped coach. This practice beat the hell out of me as I was shouting the whole time so that my kids could hear me over all of the other groups. I was exhausted at the end of the day so I expected a low score the next day. Weeks 8-9 both go well. HRV drops much lower than I had expected in response to the higher intensities. In the past, heavy workouts with low volume typically don’t create such marked drops. 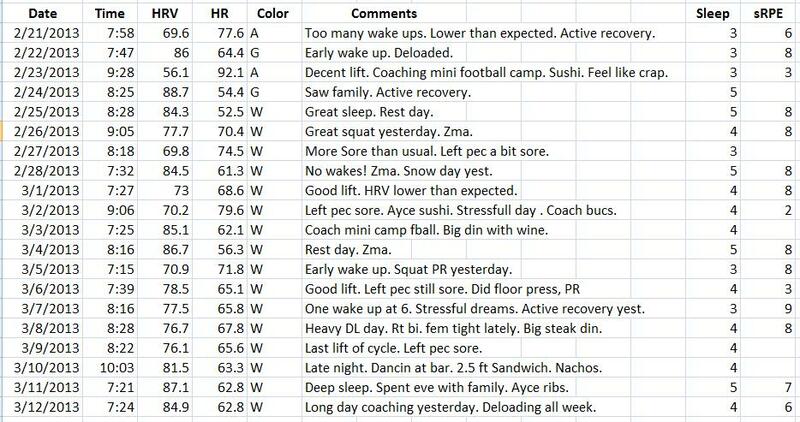 In week 9, my final week with 1RM attempts, HRV doesn’t even come above baseline. I’m also feeling beat up at this point with a sore left pec, tight lateral hamstring on my right side and overall wear and tear. HRV peaks again every weekend after rest. Week 10 is a deload week and you can see at the very end of the trend that HRV starts to climb back up. In my comments above from ithlete you can see when and where certain body parts start nagging, etc. It’s worth mentioning again (as I’ve mentioned this in previous posts), any time I spend time with my family (particularly my nieces and nephews) that I don’t see too often, my HRV is always high the next day. – 11lbs shy of my Competition PR of 551 from back in 2010. I’m pretty confident I could’ve hit this if I had a spotter. I made this lift in a relatively relaxed state. Not a true 1RM. – Due to left pec soreness I decided to test with a narrow grip floor press instead of bench press. This was probably a stupid idea. I’m glad I didn’t hurt it even more. This was a floor press PR. Pec’s already feeling better now. – This went up pretty easy. I opted to not go heavier because I’ve had back issues in the past as I’ve discussed several times in previous posts. I did not want to push it just in case. Again, not a true PR (which is 600), but it’s been a while since I’ve deadlifted this heavy due to injury. – I was pretty happy with this since I don’t always include this lift in my training. My bodyweight throughout this cycle was around 235lb. I’m moving to Alabama real soon to get started on some HRV research at Auburn. I expect that this will affect my training. I’m hopeful however that the move will be a smooth transition and that I can continue on without too much issue. Unlikely though. This entry was posted in Heart Rate Variability, Training Log and tagged heart rate variability, HRV, iThlete, powerlifting. Bookmark the permalink.